He’s really grown a lot of this year. He’s thoughtful and curious. He has a deep love of animals. His favorite animals this year, in order, were his 2016 favorites of the colossal squid, and then spent the bulk of the year idolizing bats (specifically the Somoan Flying Fox bat which has a wingspan of over 7 feet) and recently he’s super into dinosaurs. He continues to be more cerebral than physical. He’s much more content to sit on the couch drawing than kicking a ball or playing on the playground. We did get him riding a bike later this year. This is hard because it’s so hilly where we live that we can’t go out out front door and ride but rather have to drive to a school or area to do it. We had some issues potty-training him this year but he’s now past that and, in almost all ways, a big kid now. Wow, what a year for her. She’s now talking and convening her thoughts and emotions so well. From a personality standpoint, she’s a force. She’s very strong. She wants what she wants and like what she likes. She’s not afraid to speak up and lead. She often loves to step up and start telling Hunter what to do. She’s super active. From the moment she wakes up, she wants to get out the door and go running and play. She likes to try to keep up with Hunter and does so pretty well. She doesn’t like fruit or vegetables at all (sorry about those genes, sasha). She loves the color pink and is very particular of what she wears and picks out her outfit everyday (Hunter, by contrast, does not care at all). She’s still a total daddy’s girl but increasingly is all about mom too. With Sasha getting to 3, we are emerging out of infant zone. The four of us can now take a drive and all talk in one conversation. We can sit at a table in a restaurant and get through the meal without disaster striking. Heck, we’re even talking about a road trip and feeling excited about it. We’re starting to see the light at the end of the tunnel and it looks glorious. I think 2018 will be a great family year. She had a huge year. She started a new job at a startup (30 people) called Peerspace. Peerspace is a marketplace similar to Airbnb that offers locations for offsite and events. She’s responsible for host expansion and is loving it. She also crushed being a mom this year. Hunter and Diane have a special bond that is truly great to see and Sasha is typically Daddy’s girl, she currently obsessed with her. At Airbnb, there’s a new business unit and I’m running the product group for it. The role was quite a change for me as I am being stretched in new ways. It’s exciting but also exhausting. We have a launch coming up in 2018 so stay tuned. I ended last year strong and running a lot. That ended almost immediately in 2018. I injured my knee again in January/February and decided to take some time off. I also decide to try a new weight loss tactic. Over the past few years i had been steadily gaining weight and found myself at the beginning of the year at over 195 lbs, the heaviest i’d ever been. I have always relied on running and working out as a way to lose weight and with that being removed due to knee problems, i decided to focus on my eating. I knew I could limit my portions as that’s very hard for me to do. But, i knew that i could limit the number of meals I eat. That seemed doable. So, i started skipping breakfast starting in March. Surprisly, it wasn’t hard to do and it was very effective in cutting calories and thus weight. 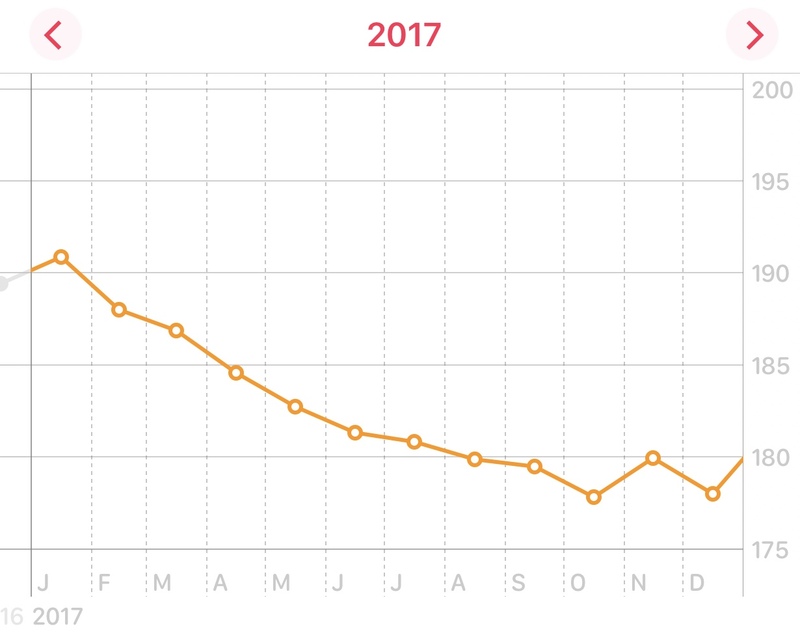 You can see from the graph below that 2017 was by far my most successful year as i dropped 20 lbs this year and ended at 175. This was the first year i started to feel old. My knee gave out at the beginning of the year and other aches started to manifest as I went on. There’s more grey hair. Heck, there’s more hair everywhere (hello, ear hair). 40 is an interesting number as I now no longer feel i’m on the upward swing of my life. I’m hitting a middle plateau, at least physically. I’ve peaked. I’m sure i could get back to running 7 min miles, but i’m never going to again run 2 miles under 12 minutes again. I also am getting the least amount of sleep ever. With the kids waking up early and the job going late, i’m burning it at both ends. It’s been an exhausting 6-12 months, and i’m finishing the year feeling old.